We're coming up on the 45th anniversary of the Cuban Missile Crisis and I think it's worth talking about. In 1962, President John F. Kennedy faced down the USSR, risking total war, and forced the Soviets to remove ballistic weapons from Cuba. Missiles located less than a hundred miles from America were aimed at the US. A lot of people, I think, have forgotten. Most schools don't even teach about it in any real detail. Judging by the indifference that many people have to the nuclear arming of Iran, I think it's a lesson almost entirely lost -- except among Cuban-Americans. Over the years, they've never stopped watching "el Comandante" -- or warning us about him. At the same time, they've been criticized by people who say that Castro is really no threat. Current events in South America, though, have proven that we should have been listening to our Cuban-Americans friends. Last week, when Hugo Chavez officially killed press freedoms, even a big part of Venezuela's far left seemed to realize that they’d created a monster. Unfortunately, it may be too late. He's already packed Venezuela's high court, legislature and military with his loyalists. Right now, he's operating without any check or balance. During his rise, Venezuelans say that Chavez spent hours a day on the phone with Castro. Additionally, Castro sent thousands of his Communist apparatchiks to help transition Venezuela from a free county to a totalitarian state. Without Cuban “help,” Venezuela wouldn’t be in the terrible mess it is today. Castro, after all, has been at this since the 1960's and he's given Chavez the benefit of his experience. There's one big difference between Venezuela today and Cuba then, however. 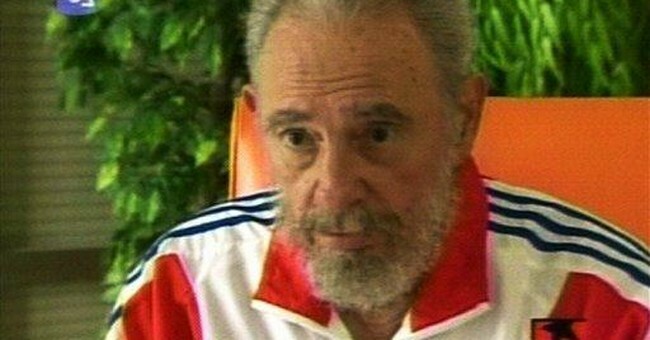 Castro needed Soviet aid to push his so-called "revolution." Chavez does not. One of his first moves was to bolster the Cuban dictatorship with oil subsidies -- a hundred thousand barrels a day to the tune of two billion dollars a year. One of the main factors preventing Cuba's transition towards democracy is Venezuelan oil wealth. On June 26, that wealth could increase significantly, as Chavez says he’ll nationalize the petroleum industry on that date. The Venezuelan and Cuban axis of influence operates openly in Bolivia, Ecuador and Nicaragua. They meddled in America's free trade negotiations with Costa Rica and support anti-American candidates and movements all over Latin America. Chavez proved and he still believes that democracies can and should be overthrown by force when he led an unsuccessful coup attempt against the democratic Venezuelan government in 1992. After his pardon, he lived in Cuba for two years. Today, he's building up Venezuela's military strength rapidly -- claiming it’s to prevent a U.S. invasion. Perhaps the biggest reason for concern is that Chavez has formed strong bonds with Iranian President Ahmadinejad. In this new era, you can't detect missile technologies with U-2 over-flights -- as did the Kennedy administration. No one seriously doubts, though, that Chavez would love to get his hands on nuclear weapons. We should also remember that Cuba sold Iran the means with which to develop biological weapons. Recall that the main suspect in the recent JFK Airport terrorism plot was arrested on his way to Caracas to get an Iranian passport. America is facing a growing threat from Latin American totalitarianism and we need to call on those who are most familiar with it to lead the resistance. And the least we can do is free Radio and TV Marti and let them fight for freedom in the realm of ideas.